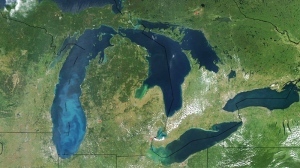 The Great Lakes dominate this true-colour satellite image made available by NASA. 2017 was a deadly year on the Great Lakes. The Great Lakes Surf Rescue Project (GLSRP) says in 2017, the group tracked 88 drownings. Overall since 2010, the GLSRP has tracked 625 Great Lakes drownings. “Knowledge is power, and I wish I had known drowning prevention four years, five months, and twenty days ago” added Zirkle. Zirkle’s son, Jermaine, drowned in a Lake Erie structural current July 12, 2013. Jermaine knew how to swim. He was an athlete; strong and smart and happy. Zirkle now advocates water safety with the Great Lakes Surf Rescue Project and is assisting the GLSRP to perform water safety presentations in schools in Ohio. In 2015, she received the National Drowning Prevention Alliance “Lifesaver of the Year” award for her water safety advocacy, and in 2016 she received the “Superhero of the Year” award presented by the Great Lakes Water Safety Consortium. Are you bothered by Amber Alerts?